Spin Cycle: Lawrence discovers that winning a revolution is largely about photo ops in the series' third installment. For some reason, there's a large swath of online culture — call it geekdom — that takes comic-book adaptations ultraseriously while scoffing at adaptations of young-adult novels. I'm not sure why. Both genres have conventions, yes. But neither has to limit itself to providing a preexisting fanbase with GIF-ready images of the characters they want to see kissing or killing each other. Case in point: The Hunger Games films have been immensely successful because they find the Venn overlap between book fans and action junkies. But with this adaptation of the first half of the third book in Suzanne Collins' best-selling series, the filmmakers hit a potential logjam in the form of two genre staples. First, they've made the common choice to adapt one book into two films, thereby doubling its ticket sales and overextending its narrative. In the case of Mockingjay, this choice exacerbates a problem stemming from the second YA genre convention: a tight first-person perspective. When Katniss Everdeen (Jennifer Lawrence) visits the ruins of her home, fire-bombed by the imperialist Capitol as retaliation for rebellion, we don't see the charred buildings and bodies at first. Instead, we see Katniss reacting to the devastation. Only after we've absorbed her horror does director Francis Lawrence turn the camera around and show us what she sees. That pattern — a visual equivalent of the book's first-person narration — remains almost constant. And when we focus on Katniss, she's generally terrified, traumatized and despairing. Some viewers, in short, will find Mockingjay a gigantic downer. While we do get a few scenes of nameless rebels in the Districts performing daring acts of sabotage, we're mainly stuck with a heroine who huddles shuddering in dark rooms, struggling with PTSD. And who's starting to see she's a figurehead. Mockingjay picks up shortly after Katniss' realization that when she was trying to survive a second battle royale in the Capitol's arena, she was actually the unwitting linchpin of a revolutionary plot. 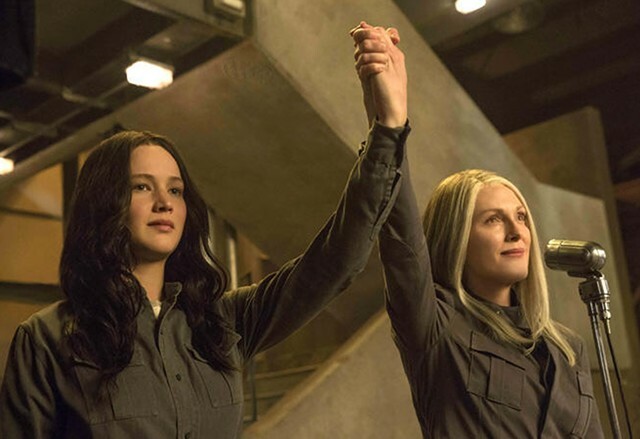 The adult puppet masters are game designer Plutarch Heavensbee (Philip Seymour Hoffman) and District 13's President Alma Coin (Julianne Moore), who offers Katniss a refuge among her hidden resistance forces. The price: Our heroine must star in propaganda spots to motivate the rebel troops, with costuming and poses that eerily mirror the film's advertising. Mockingjay is where Collins starts painting her good guys in progressively darker shades of gray, and reminding us that any actual teen who experienced this stuff would be seriously messed up. So Katniss often forgets the big picture to fixate on her game partner and maybe-boyfriend (Josh Hutcherson), who has remained in the Capitol's clutches and become the star of its counter-propaganda broadcasts. These scenes suffer from Hutcherson's failure to build up good will for his character in the previous films; as a tool of evil President Snow (Donald Sutherland), he's increasingly reminiscent of Harry Potter nemesis Draco Malfoy. Meanwhile, Katniss' other potential love interest (Liam Hemsworth) hasn't grown a personality. He does some action-y stuff here, but it's in the service of an overcooked, unsatisfying climax. Mockingjay is at its most powerful when it introduces a possibility that's daring in a YA franchise and would be almost unimaginable in a superhero one: What if Katniss isn't the master of her fate? What if she's not even that important? It's a skeptical downshift that viewers are unlikely to appreciate unless they've experienced the preceding buildup. Newbies are more likely to wonder who decided to fill two hours of valuable screen-time with adolescent moodiness. There are reasons for that moodiness, though. One is the series' increasing acknowledgment that war isn't a video game. Another is Katniss' discovery that, no, she isn't that special, but her choices still matter. It's a typical step in coming of age, but one that many adults have still to take. The Hunger Games: Mockingjay - Part 1 is not showing in any theaters in the area.